A parody of thunderf00t's rebuttal. the problem here is not the "impossible in the future"... the problem is their claim to make with today's technology ! and the fact they're ignoring/deleting all the relevant questions. if someone asks for grant to do some "weird looking" research which will possibly result in some new technology in the future - that's just ok.. (if there are excess funds to support that kind of research). but if someone claims that he developed something and he needs funding for production - and actually his "invention" can't work with current technology.. then that's a big problem ! apparently the author of the video overseen the facts around the "solar roadways" and their "inventors". Seems to me it's root cause is "It's to big to be a lie" kind of thing. People keep abstracting in all directions because of this. But, I have a question. They say tempered glass is not harder than normal glass, but I've read that tempered glass is hardness of 7 - that's very hard. BUT if the glass they're supposed to be using is 5.5, then... Anyway, is there such glass (7), and would it make things better in regards to glass DUST ? That and the solar panel's themselves seems to me like the most serious issues. Thing is, "possible with future tech" simply doesn't matter in this case, as even if some material becomes available that makes these solar roadway panels technologically feasible, they still won't be economically viable! This is because fundamental physics isn't going to change "in the future" and it will still be cheaper, and provide a large return on your investment, to just put normal solar panels on roofs / in fields & deserts etc! For example, public supersonic air transport was made technologically possible in the mid 1970's (that's 40 years ago), and since then, aircraft technology has taken a quantum leap forwards, and yet, where are all the supersonic airliners today? yup, there aren't any. This is nothing to do with the absence or presence of technology,a and everything to do with practical economics! So, if i said today, give me $100, and i'll give you $30, you would say. er, "no thanks" and if i ask the same question in 2050 (when we will all have flying cars, and robots and stuff?. Well, you would still answer "no thanks"! even if someone invents solar cells with 80% conversion efficiency and invents a transparent material with properties suitable for roads (therefore making the idea economically viable), it would be more efficient to place those 80% cells to places more suitable for producing electricity. so no matter what will be invented in the future - the road surface will be still a bad place for placing solar-cells. the biggest problem with glass is the fact that glass cracks (hard glass) or flows ("softer" glass) under load/pressure. those tiles will not last long - making the whole thing even worse (they'll never ever bay back themselves). ok.. tarmac/asphalt flows as well under load/pressure (bumpy roads) - but to fix that - they just scrape the top layer off - recycle it almost 100% (grind to smaller parts in spec, mix with fresh bitumen...etc...) and use it again. tarmac/asphalt is the most recycled industrial substance ever ! but how on earth would someone recycle those hexagons so efficiently ? recycling would just introduce further costs - making it even worse. i'm very sorry for the citizens of US if their government will keep supporting those "solar" roadways. Even if you had a solar road surface as cheap and durable as asphalt, with no extra loss, then you are still using the solar panels under quite serious non-optimum conditions. And you'll have all the current issues wiring and maintenance. Perhaps there might be a few more niche applications than currently, but not even close to what they are claiming. It's always going to be much more efficient and economical to use the panels as we currently do in an optimal way. Yes, and the lack of respect for the environment. Putting heavy toll on the earth by producing masses of inefficient solar panels and then using them in an extremely inefficient way! I can't help to wonder how they overlooked the viewing angle dependency for LEDs. Maybe they plan to mount them at an angle? All roads could be transformed into a single mega-giant capacitor! The base is the earth, then a isolation layer, then a conductive asphalt layer, this would be used to store excess energy for peak usage time YEAH! "Lighting hits road in California - zaps car going over badly isolated man hole in Miami - charred/molten remains all over 24h news networks." however as i mentioned, it might have other uses... for example i would kind of like a public square/plaza paved with those - good looking surface and produces some (not much) electricity, but enough to light up the square during night. and the pedestrians would not damage the surface too quickly (and cleaning the surface to keep the efficiency would be easy - public squares are being cleaned quite often anyways). I think the University of Dayton should demand their degreen back from this guy! Even the High school he attended should demand their degree back, and his 3rd grade math teacher probably should rethink passing him. The thing is though, now they have the money, they don't have to release any data or test results 0at all, they aren't accountable to anyone. All they have to do is deliver on the perks, the hardest of which is the small $10K demo units to 12 backers. And when this thing fails to get one single sale as a public road, and the money runs out, they will blame everyone but their infeasible idea. They'll likely produce some small private test carpark somewhere, and it'll look all pretty, but will perform like crap. ##Triples: Three 28.5 ft (8.7 m) trailers; maximum weight up to 129,000 lb (59,000 kg). ##In Canada, a Turnpike Double is two 53 ft (16.2 m) trailers, and a Rocky Mountain Double is a 50 ft (15.2 m) trailer with a 24 ft (7.3 m) "pup". Regulations on LCVs vary widely from one state or province to another. None allows more than three trailers without a special permit. Reasons for limiting the legal trailer configurations include both safety concerns and the impracticality of designing and constructing roads that can accommodate the larger wheelbase of these vehicles and the larger minimum turning radii associated with them. Most states restrict operation of larger tandem trailer setups such as triple units, "turnpike doubles" and "Rocky-Mountain doubles". In general, these configurations are restricted to turnpikes. Except for these units, tandem setups are not restricted to certain roads any more than a single setup. They are also not restricted by weather conditions or "difficulty of operation". The Canadian province of Ontario, however, does have weather-related operating restrictions for larger tandem trailer setups. In the United States, 80,000 lb (36,000 kg) is the maximum allowable legal gross vehicle weight without a permit. 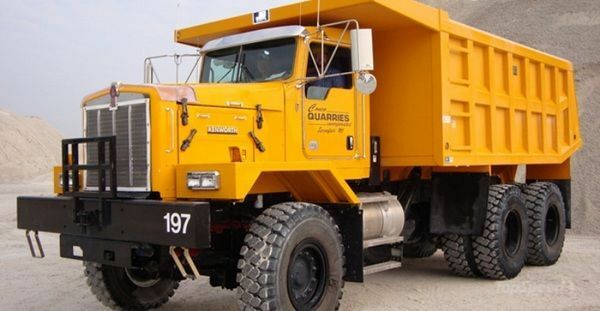 This weighs 45 Tons without any load on it and it can haul up to 75 Tons total. It probably isn't road legal but I suppose on occasion it has to cross the road or at least be towed somewhere. I think I recall that this particular truck frame can be special ordered to support 250 Tons. Gov't can always hike the taxes so that 1kWH will cost like say $2. All insanely expensive ideas will start to look different. yes exactly, and actually that $2 (or more) per kWh is the reason why i'm sorry for you guys. no worries ... 45ton empty + 75 ton load ... all that on 3 axles... that's just 40tons per axle ! that's peanuts ! they'll make the glass on the tiles half a meter thick and it's solved ! btw... one serious question... how is the glass tile supported ? is all pressure going to the 4 bolts ? or is the glass pressing against the solar panels and the PCBs beneath ? this might be an extremely serious issue. if it's just the 4 points supporting the glass - then we could compare it to driving on top of a glass table with 4 legs - so it's not only about the pressure the glass tile has to withstand. From that page we can learn where they stole that idea from! This pic was taken from our ski resort: Schweitzer Mountain Resort. Also in 2007, Schweitzer Mountain Land & Timber Company, the real estate arm of Schweitzer Mountain Resort, released 35 new ski-in/ski-out lots, approved for 1-4 units per lot, for sale in the Trapper's Creek-1 subdivision. By winter of 2007-08, heated roads, ... were installed. No one will ever finance this solar street project in large scale. Never. I am sure! We have 7,35kWp (0..+3%) solar panels on our roof under best available conditions. Only one degree out of perfect south and 36 degree upwards. That's close to ideal in north west Germany and a nice self cleaning angle. There is a 200 mm gap between panels and roof that give a cooling airflow under the modules. In the first 5 Years we have earned 37MWh. That's more than we expected. Under this conditions we need little less than 20 Years to return our investment. Don't forget that this 20 years are only possible thru massive subsidies from the State and without any credit fee on our side of the investment. And don't forget this system has to work without any expensive failures our insurance or warranty don't cover. I havent seen anyone talk about the proposed roads mitigation of accident damage. i am not sure how the proposed material and design will stand up to major accidents. compression and impact damage as well as heat from vehicular fires. if the material can not stand up to this then considerations need to be made for road repairs after a crash. we already experience congestions and delays as accidents are investigated and cleared off the road way, imagine if now large chunks of the road need to be replaced too! i just dont see feasibility even rom just the aspect of accidents let alone the other engineering issues. heres the thing, i know that this video is supposed to undermine thunderfoot's video, and the idea of the parody is to point out that the criticisms of solar roadways are ridiculous, BUT if you watch the video, the point he makes about how roads would have to be paved with bricks/and or cobblestones, and how horrible they are for so many reasons, are EXACTLY THE SAME problems that would apply to solar roadway panels. It's implied from the video showing the panels and installation concrete base that the 4 bolts are the only support. Not entirely clear though, as although the the whole of their website is filled substantial amounts of text, it contains no real information at all. Most of it is feeble excuses as to why they don't have any testing data or haven't done any of the things any reasonable person would have already done. Their FAQ page is particularly revealing of their whole attitude - mostly political style non-answers, and the few bits of information in there show a total lack of understanding. They claim that 'Most roads with high speed vehicles keep themselves pretty clean' - a quick glance at any road anywhere proves otherwise. Road damage and repairs - 'The panel could be swapped out and reprogrammed in a few minutes' - not true, as a substantial part of road repairs is closing off the lane(s) so that it is safe to do the repairs, something which will still have to be done even if the panel replacement did take only 5 minutes. There is a section about lightning not striking the ground or their glass panels because 'glass is an insulator', black marks from tyres is answered by scuffing a shoe on one of the panels once, and for energy storage, flywheels were mentioned. Flywheels. I read a whole book once in which flywheels were used as viable energy sources for motorcycles and other vehicles. However it was a sci-fi novel and therefore as far away from reality as you can get. regarding the flywheels.... those are great for SHORT TERM energy storage, but how on earth will they store all the energy to flywheels long-term ? (12 hours can be considered long-term - to store energy during day for use during night).